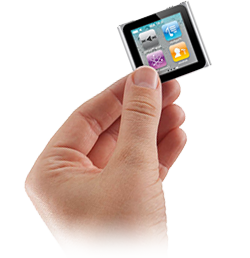 The iPod Nano 4G went back to the traditional style among iPod Nano's, it's rectangular in shape, but it does have a larger screen than the original iPod Nano 1G and iPod Nano 2G had. Since the screen stayed relatively large in size, LCD screen replacement services are often needed for this device as well. Here at The iPod Repair Centre, we commonly provide headphone jack repairs as well. This happens when the headphone jack has become damaged or is no longer working for the device. We can repair the jack and ensure that it is restored back into its original condition. If you want to ensure that your iPod Nano 4G stays working in the future, then this is a service that you should definitely contact us about. Select this repair if your iPod nano 4th generation no longer syncs with iTunes or does not charge via the dock connector. Select this repair if your battery is not lasting as long as it used to. Send it in to us for a brand new battery and a new lease of life for your Nano 4th generation.